Found this over at XDA. Battery and leather back with a purchase in July. Jaramie10 and Sabir Temirkhanov like this. I would've loved this better than the SD card! Darn it! gmac696 and limitbreak09 like this. 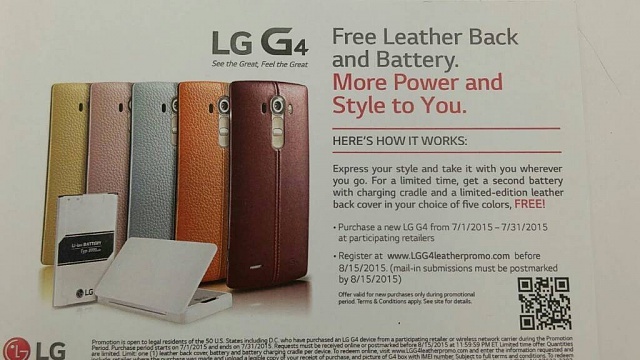 Could they offer a free battery and charger with the purchase of a leather back?? maybish and gmac696 like this. Can't wait to see what they give me in September! Jonneh, ffejjj and KPMcClave like this. That's pretty cool, I'd agree that this seems in some ways like an even better promo than the 32GB + battery + charger. If nothing else, it's a chance to introduce more people to the leather backs (owners as well as people seeing the phones). People who want more storage will buy a card. But not everyone will pony up the ~$40+ for a leather back. I do have to wonder if this is an attempt to help boost sales. Obviously that's what promos are meant for. But I mean offering a "better" promo after they've had a chance to start evaluating sales. Perhaps things didn't meet their initial goals, so they further sweetened the pot? Mikey47 and Jonneh like this. Ok, now i need to find a receipt. I feel duped. I literally just bought one at the end of June, and already submitted for the battery + sd card. but do you really want a red, blue, orange, pink, or yellow back? It's not like they are offering the brown or black. I got mine yesterday online through my Canadian carrier (Rogers) and got the extra battery/charger/sd card bonus. It also came with a black leather back in addition to the plastic one. Also, it came with a pre-installed screen protector. Hey guys, I was wonder if im not the only one going through this issue, but when I click on the redeem now button in the LG website I get a dns search from my ISP essentially telling me that the site doesn't exists and I i tried my phone and the same thing happens. I think a lot of people may be upset .. I am sure a lot would love a free leather back versus SD haha. .
On Ebay the price of leather backs will be coming down in July. Also I'd rather have the 128GB sd than the extra leather back (T-Mobile offer). You would have got the 128 GB card and a leather back though. If you wanna sell one of those backs let me know! For the T-Mobile 128GB offer, must be purchased by 6/21 unless they extended it. I know. I mean if this offer was the initial one. Which many of us wish it was. For Verizon, Sprint or ATT you can get it at best buy until 7/4 with the $100 gift card and you could turn around and buy a 128gb card with the gift card. Doesn't help with T-Mobile but great deal on the other carriers. I'm in the same boat too, i wonder if LG will let us switch promos since we got it at the tail end of the month? I already got the promo 32gb card and battery. And honestly, I'm still in love with the brown leather back. The colored ones looks a bit cheesy to me, but that's just me personally. I would have loved a spare plastic back, though. Looks like LG is going above and beyond to generate sales for this phone. New front page redesign feedback! My lg g4 keeps dimming by itself. Which android smart phone is good for gaming at low price? Why won't videos play on my new Trinity tablet?